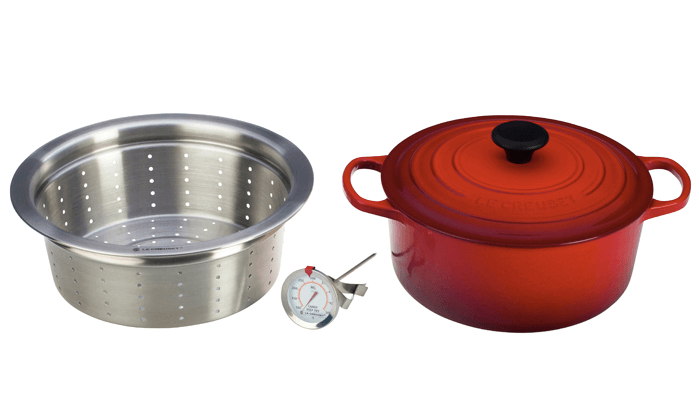 For the 4th week of our Tomato Love Recipe Exchange, we are giving away a gorgeous red “Simmer, Steam & Fry Set” from Le Creuset. (See details below!) To celebrate, Cassie has posted an amazing heirloom tomato gazpacho. 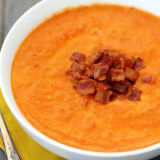 And I am excited to introduce you to one of my new favorites — Roasted Tomato Bacon Soup. This recipe is everything you love about tomato soup…and more. It overflows with beautiful fresh tomatoes, roasted to sweet perfection. Then some smoked paprika kicks it up a notch. But of course, the bacon pretty much steals the show here. 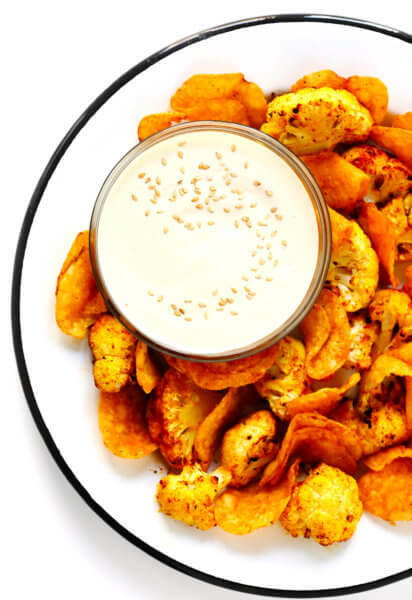 It is subtle, but just rounds everything out with that smoky, savory kick that’s pretty much impossible not to love. Overall, a very simple list of ingredients. But I loved how you could totally savor each one. My idea of a fabulous simple soup! And the pictures don’t lie. 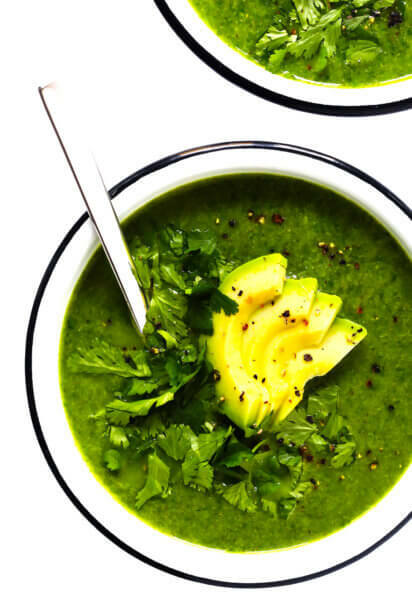 This soup is co-lor-FUL! Wowza!! 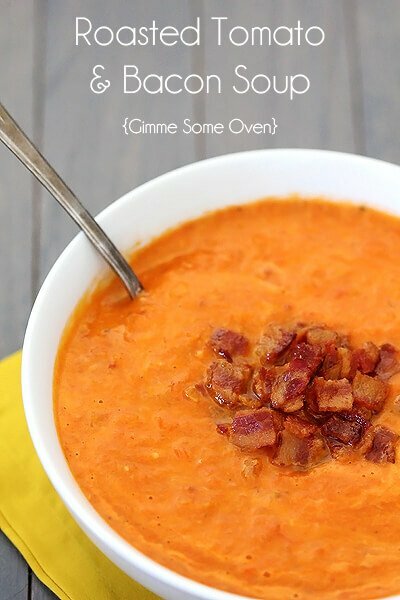 So gather up your favorite tomatoes and cook up a pot of this roasted tomato bacon soup pronto! And be sure to enter the Le Creuset giveaway below, and share your favorite tomato soup recipes below in the Tomato Love Recipe Exchange. And, be sure to visit the International Justice Mission’s Recipe For Change page, where we are continuing the conversation this summer about how to best support and care for the farmers who grow our tomatoes. Cheers to the #TomatoLove, friends! Preheat oven to 400 degrees F. Cover a baking sheet with aluminum foil or parchment, and lay out tomatoes so that they are in a single layer. Drizzle or mist with 1-2 tablespoons of vegetable or canola oil, and then sprinkle generously with salt and black pepper. Roast until tomatoes are tender, about an hour. Meanwhile, heat a large stockpot over medium-high heat. Add the bacon and cook, stirring occasionally, until crispy (about 8-10 minutes). Transfer to a heat-proof bowl and set aside, reserving about 2 tablespoons of the fat in the stockpot. Add onion and saute for about 5 minutes until the onion is soft and translucent. Add the garlic and cook for an additional minute. Then add the chicken or vegetable stock, bay leaf, smoked paprika, roasted tomatoes and cooked bacon and bring to a boil. Reduce heat to medium-low, and simmer for 15-20 minutes to slightly reduce. If desired, use an immersion blender to puree the soup. Or transfer the soup in small batches into a blender and puree until smooth. (Be very careful pureeing hot liquids!) Transfer the soup back to the stockpot and stir in the heavy cream. Remove from the heat and serve immediately. Include “”Come share in the tomato love at the Tomato Love Recipe Exchange, hosted by Gimme Some Oven & Bake Your Day, sponsored this week by Le Creuset. Also visit Recipe for Change to learn more about how to support tomato farmers.” in your blog post. Submit your post before Sunday August 5, 11:59pm CST. Le Creuset is one of my all-time favorite brands. Have loved their beautiful dutch ovens for years, but we are so excited to be featuring their new “Simmer, Steam & Fry Set” for this giveaway! This 5.5 quart French oven is perfect for making soups, stews and pastas, but the stainless steel steamer basket also allows you to steam and fry easily. It is also made with Le Creuset’s signature lightweight cast iron, with the beautiful chip-free and stain resistant enamel inside and out. I loved using it to make this soup, but can’t wait to use it to make some homemade fries and steamed veggies and fish! Check out the set here on their website, but would also encourage you to check out their Facebook, Twitter, and Pinterest pages! Fresh tomato soup is the best. I turned 25lbs of fresh tomatoes into tomato soup this summer. Cant wait for grill cheese and fresh tomato soup on a cold winter evening. My basic recipie was onion, garlic, butter, salt, pepper, lots of fresh tomatos. Cooked till soft, put through a food mill and then simmered till I got it the consistancy I wanted. Super easy! Then canned them in pints. I will add milk to the soup when I heat it to make it creamy. Roasted tomatoes have the best flavor! This soup sounds just wonderful. Roasted tomato soup is my favorite! Woohoo! I love this and the color is truly amazing. Wish I had a bowl right now! I’ve already roasted alot of tomatoes to freeze. I’ll try this with the next batch! Really? 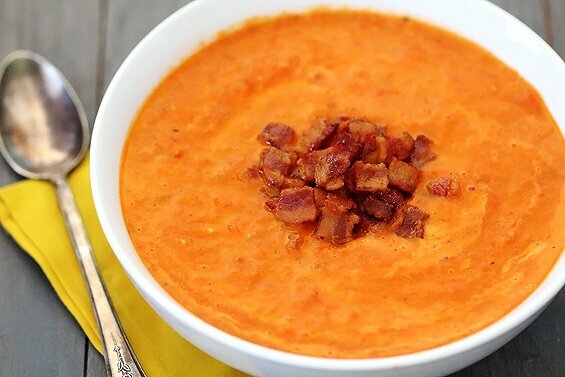 Bacon tomato soup???? Such a brilliant idea! I absolutely love this soup! I have the flu right now so all I can think about is making this and having it soothe my throat but I have no energy to cook. Maybe I can come over if you have leftovers! oh my goodness, this looks amazing!! i would love a huge bowl of this to nurse my cold right now. i’m bookmarking this for some delicious comfort food when winter comes around — would be awesome paired with grilled cheese! I Pinned it here http://pinterest.com/pin/237776055297172595/ oh, I would LOVE to win. 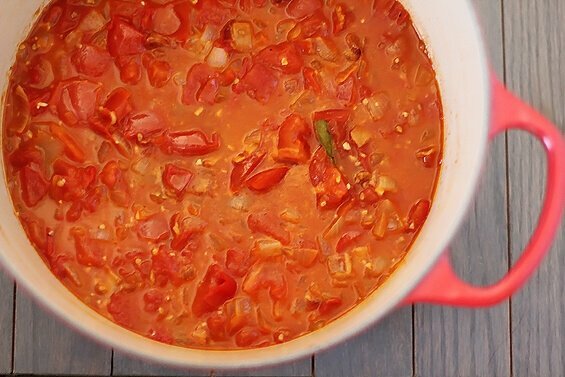 This soup looks so good, can’t wait to give it a try when I get a bunch of ripe tomatoes! I love roasted tomato soup! My tomatoes are taking their sweet time here in the Pac Northwest, so i’ll have to wait a little while to make this. Hopefully the farmers have some juicy tomatoes this weekend at the market though. Beautiful! This sound sounds so full of flavor and delicious! Perfect for the garden tomatoes I have! Shut the front door! This looks so amazing. Bacon and roasted tomatoes go together like Batman and Robin. Can’t wait to dig in! Oh yum! Roasted tomato is the only tomato soup I like. Love the bacon topping! I don’t really have a recipe, but I love to take grape or cherry tomatoes, cut in half lengthwise, sprinkle with salt, pepper and olive oil and slow bake for several hours. 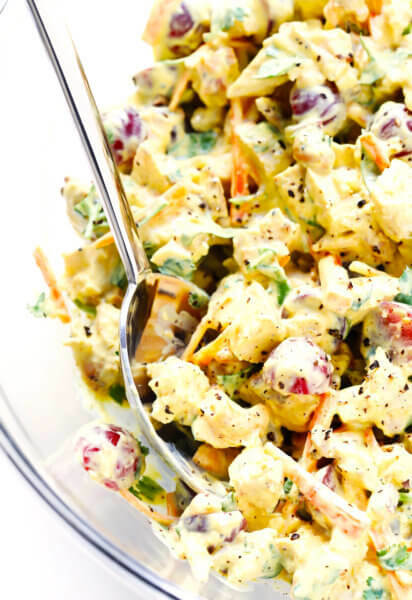 They are so sweet, and wonderful in salads, with sandwiches, or just for a healthy snack. In big pot, cook the bacon over medium heat until lightly browned. Add the onions and cook, stirring, until wilted. Add butter and stir until melted. Add the lettuce and saute for 2 minutes. Sprinkle the flour into the pot, then stir it in until well blended. Remove the pot from the heat and add the hot chicken broth, tomatoes, nutmeg and pepper. Heat the soup to boiling, stirring constantly, then reduce and simmer gently for 5 minutes. Add the cream and mix well. Mix together the mayonnaise and sour cream. Serve each portion of soup with a dollop of mayonnaise mixture topped with crumbled bacon. Yummy! Tomatoes and bacon?! Best soup ever! I am just in the process of making the soup and noticed that in the directions it talked about a bay leaf but there isn’t one in the ingredients? Should I add one or not or does it matter? Hey Julia, you could try blended/pureed silken tofu (equal parts), or Lactaid whole milk. I hope that helps! You are absolutely right, Chelsea — we apologize and have just edited the recipe to reflect both of these things! I live alone (with my furbaby) and I was wondering since most of these are 6-8 servings; are all your soups freezable?